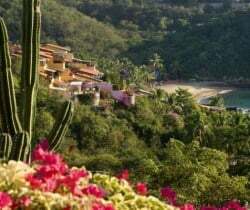 The huge, wide and untouched beaches of Costa Careyes – dubbed the “Tierra de Reyes” – lie north of Acapulco between Manzanillo and Puerto Vallarta and, in the heart of this tropical paradise, is an electrifying luxury villa that is located within a glamorous enclave. There are two international airports within 1.5 to 2.5 hours drive, as well as a private airstrip 20 minutes away from this compound, which is meticulously maintained and very secure. 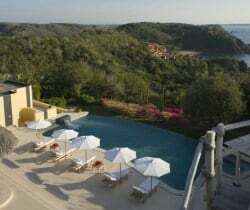 The villa is one of several private residences in a private compound, created by an Italian gentleman who, in the 1960s, fell in love with this spot and decided to move here and build an idyllic abode. 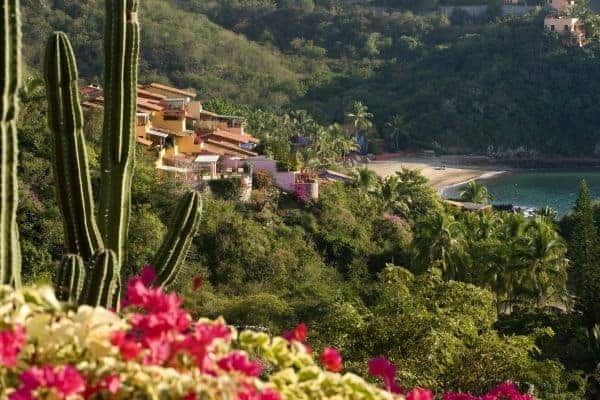 His vision and respect for nature has made Careyes a super luxury destination and one where you can enjoy rare spectacles of nature such as whale migration and sea turtle egg laying and hatching. This luxury villa features an open plan design and bedroom annexes for privacy. Thatched palapa roofs blend into the tropical surroundings and the bohemian ambience invites shoeless relaxation at this stomping ground for the bashfully rich and famous. 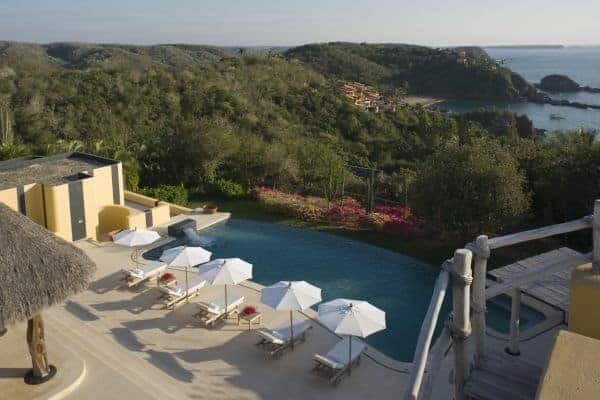 The villas are entirely secluded from one another and all are elevated to maximize the awesome panoramic views. This luxury villa has a voguish colour design combining vivid Mexican yellows and with black striping motif on exterior walls, and it is emphatically peaceful; the only sounds emanating from the profusion of tropical birds and the silent whirr of ceiling fans in the breezy living room. Outside the arrangement of the terraced grounds is, like the interior of the villa, beautifully maintained, with quality furnishings. The luxury villa has 5 air-conditioned bedrooms en suite in separate annexes and will readily accommodate up to 10 guests. The master bedroom is an enormous sprawling spread of luxury and the other rooms (3 king, 1 twin) are generous in space and furnishings. A cinema room annex can be also an additional bedroom for children or occasional guests. (For added privacy, the permanent housekeeping staff is housed in a separate part of the grounds). Most of your time here will be spent outdoors, especially as there are reclining loungers and day-beds on the terraces. The large swimming pool has a heated Jacuzzi recess at one end. The view encompasses an inspiring panorama of lush tropical greenery, tall cacti and coastline edged by a flat, calm stretch of turquoise sea. A delightful cove beach – Playa Rosa – is a gentle 5-minute stroll downhill and here you can sit beneath the shade of tall palm trees, swim in crystalline water and enjoy local cuisine in the tiny restaurant, which once used to be the founder’s own private residence. You can also go horseback riding on lonely and expansive sand beaches or try to catch a Marlin out at sea! At night, under sparkling stars, you can light up a Cohiba cigar in honour of the villa’s vibrancy and toast another wonderful day in paradise with a delicious Margarita prepared by the delightfully attentive in-house staff. The unique villa will be nirvana for those who place a premium on luxury and unpretentious relaxation. In fact, it is ideal for people who do not even want to know they are there! The villa is family-friendly, though many steps within the terraced grounds are unsuitable for small children and the less mobile. If you need twice the privacy, it may be possible to book this villa with its bordering property that is of the same ownership.